Remember those days and nights? They all blur together when you are caring for a very tiny human. You feel house bound, exhausted and maybe even lonely. After my first born was a few months old I began to feel “more human”. I wasn’t sleeping very well, I was feeling alone and craving adult conversation. Where to look, where to start? 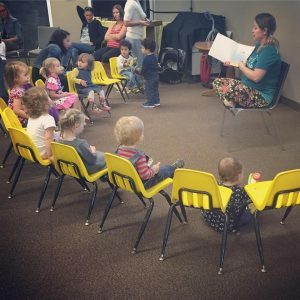 I started at drop-in play groups. It was nice to get out of the house and socialize but every week there were new faces, new conversations. It was hard to break into formed friendships and after a few months I stopped going back. I went to my first event, a Meet and Greet and wow, it just fit! Everyone was friendly, engaging and interested in my story. 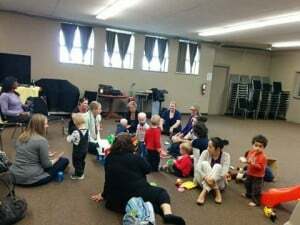 Held in a large open, but secure space where I could enjoy social time and support from other local mommas. My daughter crawled around happily with her new tot pals. We got see many of the same moms week after week. I made fast and meaningful friendship. I found my village. The goal of KW Moms Club is to help you expand your village through social and educational programs plus 24/7 online support for moms and their little ones. There is a calendar full events for ages 0 and up including Baby Basics, Toddler Time, Discovery Field Trips and so much more. Many of the programs provide a social opportunity for our kids and keep them safe and busy while we let our hair down and put our feet up. The program spaces are chosen with the busy toddler in mind, always secure and you will definitely find babes in the arms of other moms. We take care of each other! We enjoy programs like Moms Night Out, Crafty Mommas, Book Club, Freezer Meal/Recipe Swaps and Mommies at the Movies. Moms have access to an intimate community chat where we share, boast, lament and offer peer directed online support. What else is a moms to do during those feeds in the middle of the night? Log in and find someone there! We truly are a village! So, when the time is right, I implore you: get out there and find your village. Shop around until you find your village. Make new connections and share the bond of motherhood. You won’t regret it!